Korenix is glad to launch its new cellular gateway JetWave 2411/2111 series. The series are slim size cellular router/ IP gateway which are designed with only 35mm wide. The design allows it to easily fit into small cabinets or machines when space is limited. It is also equipped with embedded 4G LTE Cat4/ Cat1 module that supports up to 150M DL or 10M DL. Moreover, it is equipped with one SIM slot, one Micro SD slot and also supports remote management, secure connectivity and firewall/ NAT features. Korenix JetWave 2411/2111 are designed in compact size with only 100mm X 100mmX 35mm. The palm- sized device can easily fit into different occasions, such as AGV car, machines or small cabinets. Moreover it supports 24V DC power input and operates in temperature from -40~70℃. The compact and robust device is suitable for harsh environment. 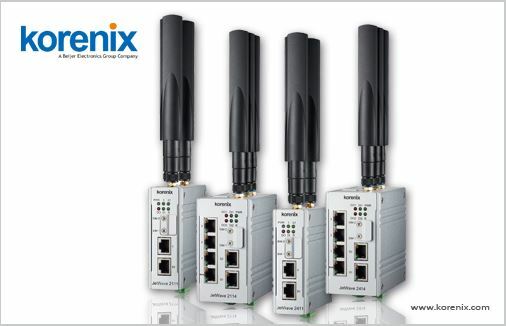 Korenix JetWave 2411/2111 LTE cellular gateway is supported with the LTE technology. With the Long Term Evolution (LTE), it is able to provide stable data communication when long distance transmission is required and in environments with barriers. It is specially designed for factories or places where walls, machines and rackets might block the signal. The device is suitable for the M2M market. The device allows remote monitoring. It can be easily installed and monitored through Korenix monitoring system. The GPS feature is an optional function that allows controller to track down the device.